1. 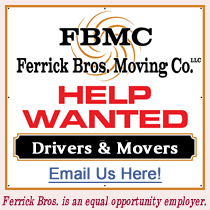 Call Ferrick Bros. Moving Co. (FBMC) as soon as your home is put up for sale. By calling early: (978) 225-0158, you can explore all kinds of moving options. After the Purchase & Sale Agreement is signed, your options disappear.